At times I believe that with the ever increasing pressure from European Starlings, it would be just a matter of time before purple martins become extinct! Luckily for us landlords Charles McEwen of Mocton, NB developed the SREH or Starling Resistant Entrance Hole. This development has single-handedly helped save more purple martins than we will ever be able to count. The starling resistant Crescent entrance, which has given rise to nearly a dozen variations has virtually neutralized the threat of the invasive European Starling to our native songbirds. Many folks deal with the pressure and destruction caused by starlings entering their round holed colonies, rather than converting their entrances to SREH because of the apparent difficulties one can have in teaching your martins how to navigate such an odd looking entrance. Looking at the entrances it is no wonder, the shapes are downright strange and seem to defy logic. How would a bird get in? But trust me! They do! 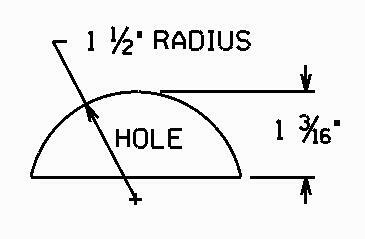 As I stated before there are many types of starling resistant entrance holes, some of which are protected by patents and copyrights. Some have even touted Starling Proof entrances, though in my opinion, it is a bit premature to stake that claim. You can read more about “starling proof” entrances HERE. There are also many opinions as to which SREH is better or more effective than the next. I have only tried a handful myself and even with SREH I continue to trap non native starlings at my colony. Most of my 30+ compartments are Conley II (also called “The Clubhouse” entrance) and crescents. I have a gourd with a modified Excluder and one with an Excluder II also. ALL fill with martins. I must admit that at first I had some issues switching them over but eventually they got the hang of it. If your colony is established, that is they are bonded to your site and have nested there before, they should figure it out pretty quickly. You may witness the SREH Shimmy (as I call it) which is often mistaken for the martins “not fitting” into the new entrance hole. Do not fret, these designs have been designed and tested with many thousands of martins and they will fit in it. The martin will stick his head in and make it appear as if he can not fit. He may even appear to squeeze and push, to no avail. Trust me though, if the entrance is either bought from a reputable source such as www.EntrancesbySandy.com or www.PurpleMartins-R-Us.com or comes pre manufactured, the sizes are carefully measured and the bird can fit. Be patient. Many landlords suggest keeping a few round holed compartments available. The rounds will fill first but the desire to stay together at the colony will get the other martins to eventually get in the starling resistant entrances. Of course you must intensify the battle against any starlings, as they will now be focused on the few round nests that remain. This will buy some time for the martins to become familiar with the change and master the entrances. It just will take time. A couple of days at the most. Consider building a repeating nestbox trap or purchase one pre built. Also called a S&S trap these can trap repeatedly without resetting. Since the trapped bird is released into a holding cage, the trapped birds can tolerate it much better than a conventional nest trap. That is to say, if you leave the house for a few hours and a native bird is trapped in the repeater, they will be none the worse for wear when you get home. In a regular nest trap, the bird won’t do well at all. I would never recommend leaving a regular nest trap set while not actually watching it. Stuck in a closed off gourd or house with little air flow-It gets hot quick. Also you can stick the repeating nest box trap in a spot that is less desirable to the martins and lure the starlings away from your martin housing. If your colony is new, that is you are still trying to attract your first pairs of purple martins, then converting them can be a bit trickier. Hopefully the martins that come to investigate your site come from a colony that uses SREH. If they are familiar with them they will enter the compartments like quicksilver. If they are not familiar with SREH then leaving from a couple of entrances to half the compartments with round entrances will work. Monitoring your housing and keeping starlings out becomes even more important to these new colony sites and trapping and neutralizing is key. Local Starling population control can reduce the pressure form these invasive birds and increase the possibility of attracting and keeping your first pairs of martins. Now for the downside. Though SREH are a wonderful tool that has helped martins to flourish in otherwise starling infested areas, their are risks. Though not common, Wing Entrapment can kill if not caught. I have encountered this problem a couple of times at our colony and you can read about Wing Entrapment HERE. When using SREH it is recommended that you look at your colony twice a day to observe for any martins that may be entrapped. Entrapment usually happens at the peak of martin breeding season when martins will often have territorial fights within the nest. The birds back up to the entrance while fighting and get their wings stuck. Lowering your housing and gently removing the stuck bird will not only save the life of the martin that is stuck but the 1 or 2 other martins that (I guarantee) are in the gourd with it. Unfortunately there are no sparrow resistant entrances, when it comes to Purple Martin houses. So getting a good trap either nestbox or a baited trap becomes essential. REMEMBER, when using traps of any type, monitoring is essential to preventing harm to native birds that may be inadvertently trapped. Native birds may not “learn” that it is a trap and are often caught repeatedly. If you are unable to monitor your traps they should be disabled while you are away. ACE entrance designed by R. C. Moser and developed by Bob Flam. Though it may make a cute picture, the mix of purple martins and extended adverse weather spells almost certain death for our feathered friends. And by extended weather, we are only talking about 2 days or more. Knowing what you can do will help your colony survive these early spring cold snaps. 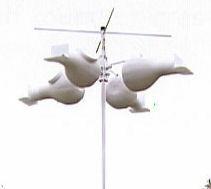 Adverse weather, to a purple martin, is 2 or more days of steady rain and/or wind and/or cold temperatures below 40F. Only one of these conditions will make it virtually impossible for a purple martin to find enough food to sustain itself. Being strict aerial insectivores, purple martins have no recourse when it comes to extended weather issues. They can’t forage for food on the ground and when temperatures dip, flying insects are no where to be found. With our crazy weather patterns we have been having and severe snow storms that have it snowing as far south as Florida, it is important to know what you can do. So what should you do? ACT FAST! Don’t wait for your birds to be too weak to fly before offering supplemental feeding. Purple martins have to be trained to accept our help as they do not recognize food left out for them. If you wait too long your entire ASY purple martin population can die from starvation in just a few short days. Q: What do you feed a purple martins? A: Crickets are the first choice for beginners. Mealworms or Scrambled Eggs are good once they learn to accept what you offer. But these items must be prepared. Mealworms and crickets (if live) should be frozen -till dead, then thawed thoroughly. They can be soaked in water and drained before feeding. Eggs should be cooked using NO oil or butter of any type. Q: How do you feed a purple martin? A: Martins that have never accepted supplemental feedings have to be taught or conditioned to eat food we offer them. After a day or 2 of adverse weather, approach the colony slowly. Use a large plastic spoon and fling a cricket up in the air in the general direction of the martins, up over them…remember you aren’t trying to hit the martins with the food. You want them to see the food flying past them. Continue this for 10 to 15 minutes. Most folks report that by the end of that time one or two birds will try to catch what they see flying by and once one starts, others will follow. Once they accept food from you, the crickets (mealworms or scrambled eggs) can be placed on an elevated platform feeder and they will eat it off of the platform. Visit this link on Supplemental Feeding of Adult Purple Martins for more information. After capturing the female in the old faithful S&S Repeating Nest box trap, the male continues to come by. Usually in silence, he lurks on the gourd rack watching the goings on around him. I have left him alone for now. For no other reason except that he poses no real threat AND I am a horrible shot. The S&S awaits him and I am sure that when he finds a girl to bring by she may take a gander at the trap herself. I do have my old plastic martin house attached to the side of my home that I welcome any starlings to nest in. Since the house will not attract anything other than the starlings, in my neighborhood, it should do nicely as a trap. The S&S repeater trap plans are available as is the ASSEMBLED trap also. The assembled trap is already put together and only requires minimal assembly of the pole. I still have not noticed any SY martins and due to some odd weather the martins seem to be out feeding a lot. Between record low cold fronts and rain storms with gusting winds upward of 30 mph, the martins seem to be conserving their energy. Remember that you can watch the exterior of the colony on our live streaming webcam at PurpleMartins-R-Us.com. I am not sure how long this deal will be going on. It includes a New Starter 4 purple martin gourd rack and 4 Troyer gourds of your choice. The usual cost for this system is $250. The special package price is only $218 which makes it a bit more cost effective for those that are looking to buy an inexpensive martin house. These Starter 4 racks are new to the market place and feature a pulley system for those that don’t want to deal with hoisting up a telescopic pole and want the benefits of a gourd rack at a great price. I started out in purple martins with telescopic poles but soon discovered that my manicure was allergic to raising and lowering the poles. I am a steadfast lover of gourds over houses. The main reason is they truly reduce dominance by male purple martins that can chase other prospective residents from your house. The gourds are spaced far enough apart that this porch dominance doesn’t take place as much. Besides, gourds look cool! The season seems to be amping up already. On 2 separate occasions, another bird or two would arrive to much singing and over all fuss and commotion. I counted a dozen easily. Of course, there is no way to know if those are my birds or others visiting from surrounding colonies, but there seemed to be birds singing about the gourd racks for much of the day. Early in the season, after 11 am or so, the birds leave and it would be relatively quiet for much of the day. Today however, there seemed to be birds chortling and going in and out in a most robust manner. The weather was sunny and pleasant. Flies were all over the back patio so I am sure food was abundant for the martins as my fly swatter was busy taking care of the low flying bugs. I hope all your houses are up and ready!